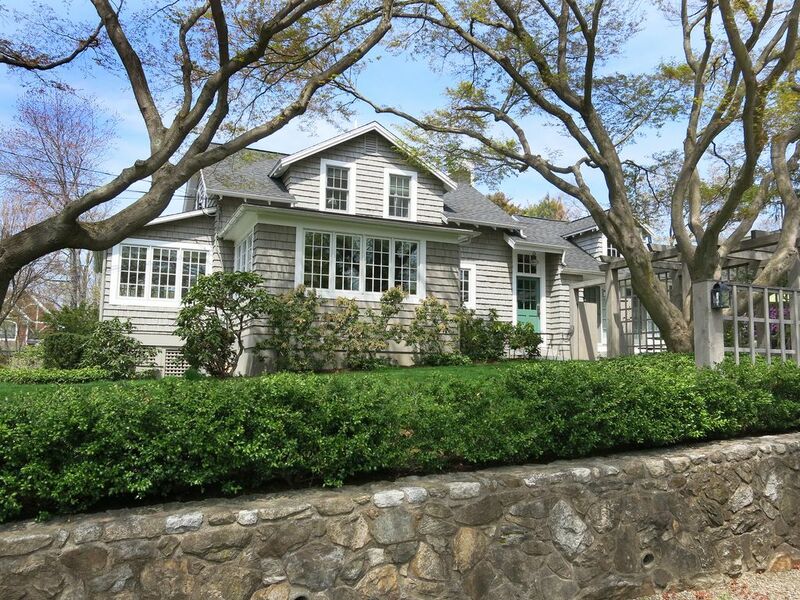 Lovely home in the friendliest and best walking town in all of Fairfield County. Lovely, quiet home and landscaping designed and renovated by Barbara Garfield, who was a well-known, much sought after architect. Everyone who walks in the door says, "I love the light and the charm." This residence is beautifully maintained and pristine clean with the original stone fireplace. Great space for cooking with a gas stove and large sub zero. I always wanted a couch in my kitchen and Barbara, who was an expert at making wishes come true, found space for a love seat! Large master bedroom (15 x 20) with shower and plenty of closet space on ground floor. Three charming bedrooms and bath upstairs. Garden, also designed by Barbara, is perfect for entertaining/eating/grilling and sunbathing! The landscaping provides plenty of privacy (Witch Park in front) and best part, the house is just around the corner from all the action. Moments and minutes (under 2) from popular attractions that people throughout Fairfield County enjoy including Pinkney Park which hosts Shakespeare on the Sound, concerts, movie nights, and the Farmer's Market. Also, enjoy eating out on the river deck at Rowayton Market (owned by French chef), kayak and boat rentals, Rowayton Arts Center (with art programs). Another 2 minute walk down Rowayton Avenue, you will find the Rowayton Pizza Parlor (no waitin' in Rowatin"), Brendan's 101 Cafe/Ice Cream Parlor and the famous Restaurant at Rowayton Seafood and Fish Store where you can eat with beautiful views of Five Mile River. Another five minute walk and you can enjoy our own Farm Creek Nature Preserve, find your favorite book in our library and relax/swim/play tennis at Bailey Beach. I love Rowayton. I came here as a young child and never left. Now my two daughters, son-in-law and three grandchildren live here. We feel so fortunate because it is a very special town. It is the best walking town I've ever seen. Almost every day, I do a 3-mile loop through town by the river and then by many beaches and beautiful homes. There's always plenty of activities going on here -- at Pinkney Park we have Shakespeare on the Sound, live music, the Farmer's Market and outdoor movies. We have great swimming at the beach, a wonderful library, an arts center where you can take classes, water sports and boating, restaurants on the water and friendly people around every corner. My home is very quiet and private but we are close to everything (just 2 blocks) including Pinkney Park, the village with restaurants, cleaners, liquor store, bank and hardware. Both the beach and train to NYC are within walking distance as is the library and Farm Creek Nature Preserve. Actually, you don't have to have a car; you can get around on foot or cycling and, except for maybe a visit to NYC, you won't want to leave. My home faces south and has wonderful light. The house and garden were designed/renovated by Barbara Garfield, a well known architect who has built many beautiful homes in Rowayton. Everyone who visits loves the light and the look of the house. The garden is also so peaceful and a wonderful place to entertain. toilet, shower, Downstairs master bathroom. toilet, combination tub/shower, Upstairs bathroom with tub/shower. House is located in a very desirable part of Rowayton. Close to town, Pinkney Park on the Five Mile River and the restaurants and only 1 mile from the beach. Lots of towels including beach. Comfortable seating with 1920 stone fireplace. Everything a good cook needs. Cook's kitchen with all clad pots, pans and sharp Wusthof knives. Farm table seats 8. Can see fireplace from dining area. Also love seat in kitchen/dining area. Four television sets in downstairs master bedroom, kitchen, sunroom and upstairs bedroom. Beautiful garden area for grilling/entertaining and sunbathing. Down Under, on the Five Mile River, one block away rents kayaks and paddle boards. My husband and I have stayed in this home many times through the years and it has everything you could possibly need. It is charming but, even more importantly, it is comfortable. The kitchen is great for cooking and if you are a gourmet cook you will be thrilled by how well equipped it is. The house is in the perfect location so once my husband and I stepped outside the door, the adventures began. One day we ate lunch on the deck of the local market overlooking the river while watching people enjoy their boats and kayaking. Another day we had pizza and listened to live music at one of the many local eateries followed by a visit to a sweet ice cream/deli shop across the street. We took walks down by the many beaches overlooking Long Island Sound dotted with islands and light houses. We plan on coming back in the summer to swim at the beach and hear some of the concerts that Rowayton is famous for. Just loved walking all over this very special place. Rates are subject to change until booked. Strongly advise renters purchase travel insurance.